We finally took a listen to the new album. After the gig with Kuro Yagi Shiro Yagi last week, Makigami played the yet-unreleased album entirely through the PA system of Bar Isshee in Shibuya, Tokyo. We don't want to spoil your listening pleasure so keep it short - It's great of course, and there's one thing we'd like to tell you - it's not like any of their previous efforts. It's hard and pretty rocking. The rhythm section is tight as ever. It's hot as well, and we respectfully suggest you rush out and grab a copy. HMV Japan now takes a worldwide pre-order. The link is here. Yes, it is. Orguss 02 OST, one of the most sought after Hikashu releases, will get reissued at last. The album has already been remastered and now plans to be out in late May. Originally released in 1992 as an original soundtrack of the video animation series, it is also the only so-called "media tie-in" title the band ever committed. After the original release, it has never been rereleased before and now became a collector's item, unfortunately. 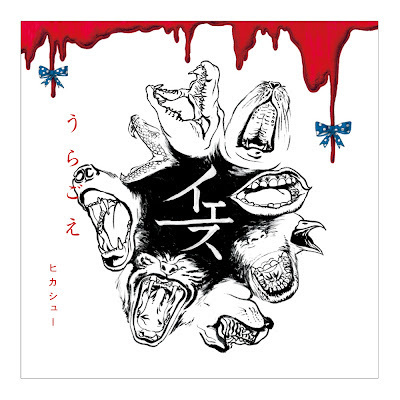 The remastered edition has a bonus track as well - the edited version of "Fushigi o Mitsumete," which is the one used on the actual video release. It's official. This year's Jazz Art Sengawa, the annual festival of jazz, improvisation and avant-pop, will be held on July 20-22. Appearing will be Fujiwara Kiyoto, Sakamoto Hiromichi, Makigami Koichi, Oki Itaru, Cicara-mvta, Pet-Bottle Ningen, Kurachi Kumio, Kikuchi Naruyoshi, Sotoyama Akira, Ohtaka Shizuru, Kuramubon Mito, Davide Santorsola, Hikashu and more! The album has been mastered and now waiting to be released. Although the official date for the album release has been set on April 8, you could get the disc before the date, at the album release concert on April 5. Buy the album and support the band! Hikashu unveiled the cover art by Tabaimo and the track listing for their forthcoming album, "Uragoe." Here we list English titles for each track. Please note that those are not official, just our interpretations, and prepared only for sake of convenience. Still, some titles could not be translated (4, 7). These look like adverbs of classical Japanese (wikipedia) but we're not sure. Anyway, need not mind the meanings and enjoy the sounds of those words since they're almost incomprehensive, even for natives. Also, several have already pointed out that track 13 might be a quote from the short story by R. A. Lafferty (wikipedia). Right now, the album is waiting to be mastered and it is soon. The release date is April 8th. 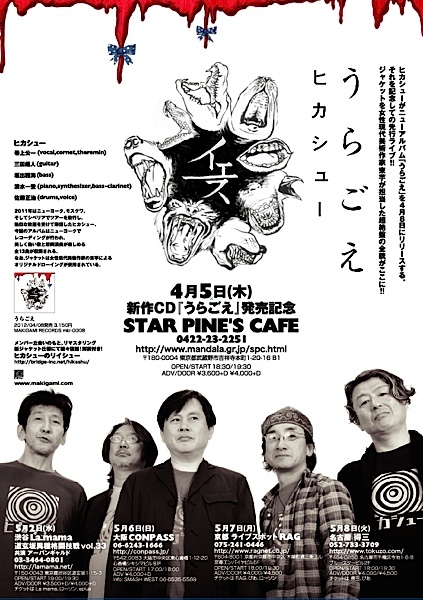 On May 2, Hikashu will perform at a double bill concert with a rising techno combo, Urbangarde. Self-proclaimed "a traumatizing techno-pop band," Urbangarde was formed in 2004. Having gained a reputation as a notable act, they landed a contract with major label Universal in 2010. The leader Matsunaga Temma said, via twitter, that he's glad of the opportunity as being a long-time fan of Hikashu, and now considering to play the band's tune at the concert. It's announced that Club Jazz Byobu is selected as a finalist for the prestigious Ito Kisaku Award of set design. Organized by Japan Association of Theatre Designers and Technicians (JATDT), the award is given annually for the best set design works of the previous year and named after Ito Kisaku, the famed set designer known for theatre and film. The entry for Ito on IMDb is here. Club Jazz Byobu, proudly billed as "the world's smallest jazz venue," is a movable stage set for performance and operated in conjuction with Jazz Art Sengawa. 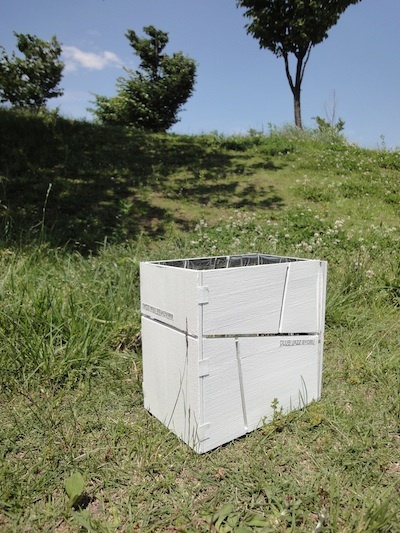 Nagamine Maki, the designer, expressed her delight for the nomination via twitter and thanked to all involved for their support. Also, there will be an exhibition of the nominees for the award at Kinokuniya Gallery of Shinjuku this month. Of course, Club Jazz Byobu will be displayed with related documents, along with other finalists. Nagamine Maki performed at Prague Quadrennial Japan Booth on June 18, 2011. 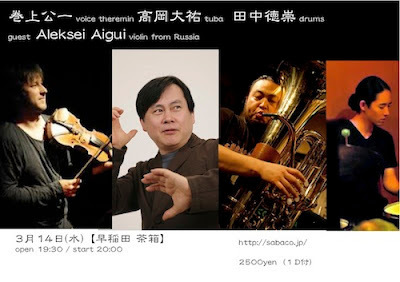 "Finalists for the 39th Ito Kisaku Award"
Aleksei Aigui, a noted composer and violinist based in Moscow, will visit Tokyo this month. In response to his visitation, Makigami Koichi organizes a session of improvised music on March 14, with Mr. Aigui as a guest. This is the second time for the two playing together. Mr. Aigui has performed with Hikashu at their Moscow gig last year.